WHEN THE Department of Education last week released the results of the latest National Assessment of Educational Progress — “the Nation’s Report Card’’ — the bottom line was depressingly predictable: Not even a quarter of American students is proficient in US history, and the percentage declines as students grow older. Only 20 percent of 6th graders, 17 percent of 8th graders, and 12 percent of high school seniors demonstrate a solid grasp on their nation’s history. In fact, American kids are weaker in history than in any of the other subjects tested by the NAEP — math, reading, science, writing, civics, geography, and economics. How weak are they? The test for fourth-graders asked why Abraham Lincoln was an important figure in US history, and a majority of the students didn’t know. 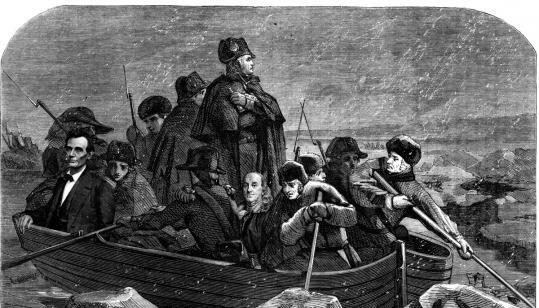 Among eighth-graders, not even one-third could correctly identify an advantage that American patriots had over the British during the Revolutionary War. And when asked which of four countries — the Soviet Union, Japan, China, and Vietnam — was North Korea’s ally in fighting US troops during the Korean War, nearly 80 percent of 12th-graders selected the wrong answer. Historically illiterate American kids typically grow up to be historically illiterate American adults. And Americans’ ignorance of history is a familiar tale. When it administered the official US citizenship test to 1,000 Americans earlier this year, Newsweek discovered that 33 percent of respondents didn’t know when the Declaration of Independence was adopted, 65 percent couldn’t say what happened at the Constitutional Convention, and 80 percent had no idea who was president during World War I. In a survey of 14,000 college students in 2006, more than half couldn’t identify the century when the first American colony was founded at Jamestown, the reason NATO was organized, or which document says, “We hold these truths to be self-evident, that all men are created equal.’’ Numerous other surveys and studies confirm the gloomy truth: Americans don’t know much about history. Somewhere in heaven, it must all make Harry Truman weep. He never attended college and had no formal intellectual credentials, but Truman was an avid, lifelong student of history. As a boy he devoured “Plutarch’s Lives’’ and Charles Horne’s four-volume “Great Men and Famous Women,’’ developing an intimacy with history that would later become one of his greatest strengths. “When Truman talked of presidents past — Jackson, Polk, Lincoln — it was as if he had known them personally,’’ the historian David McCullough writes in his landmark biography of the 33rd president. Truman may have been exaggerating in 1947 when he told Clark Clifford and other White House aides that he would rather have been a history teacher than president. Yet imagine how different the NAEP history scores would be if more teachers and schools in America today routinely imparted to their students a Trumanesque love and enthusiasm for learning about the past. Alas, when it comes to history, as Massachusetts educator Will Fitzhugh observes, the American educational system imparts a very different message. While the most promising high school athletes in this country are publicly acclaimed and profiled in the press and recruited by college coaches and offered lucrative scholarships, there is no comparable lauding of outstanding high school history students. A former public school history teacher, Fitzhugh is the publisher of The Concord Review, a journal he began in 1987 to showcase the writing of just such exceptional student scholars. The review has printed 924 high-caliber research papers by teenagers from 44 states and 39 nations, The New York Times reported in January, winning a few “influential admirers’’ along the way. But this celebration of what Fitzhugh calls “varsity academics’’ amounts to just drops of excellence in the vast sea of mediocrity that is American history education. Another kind of excellence is represented by the National History Club that Fitzhugh launched in 2002 to encourage middle and high school students to “read, write, discuss, and enjoy history’’ outside the classroom. Beginning with a single chapter in Memphis, the club has grown into an independent national organization, with chapters in 43 states and more than 12,000 student members involved in a rich array of history-related activities. “Our goal,’’ says Robert Nasson, the club’s young executive director, “is to create kids who are life-long students of history.’’ He and Fitzhugh have exactly the right idea. But as the latest NAEP results make dismally clear, they are swimming against the tide. Jeff Jacoby can be reached at jacoby@globe.com or Twitter @jeffjacoby.